Okay okay okay. You don’t know where to start. Lets do some quick explanations of backups, and then get you setup on the easiest stuff from 2014. A backup is a copy of something. In your case, it’ll be your videos, pictures, (maybe) music etc. Back in the days of old, this was on floppy disks. 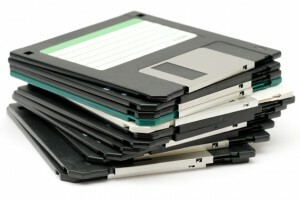 Once copied, these disks are then hidden out of sight somewhere they don’t burn down with the rest of your house. This progressed through the ages through smaller floppy disks (DO YOU EVEN REMEMBER THEM?) , zip drives, large capacity tape drives, CDs, more-common-these-days DVDs, external HDDs, USB sticks etc. 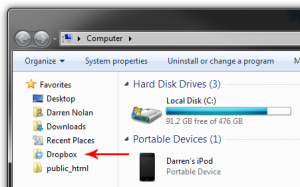 In 2014 – (Crap, I’ve been doing it since 200gb of internet/mth was less than $100/mth… which is a while, unless you’re with Telstra) you can use another backup media type called TEH INTARWEBZ. I mean, The Internet. So let’s get you started, here’s the two main things I use, in order of my personal use. Dropbox I used because many moons ago, lots of people used it, I’ve just kept with it, it continues to be free for me (Buying Samsung Android phones, I seem to keep getting 12 months free with loads of space). After installing on your computer, you get a new folder. You put all your pictures in it. And magically it goes up on the web, only for you to see. 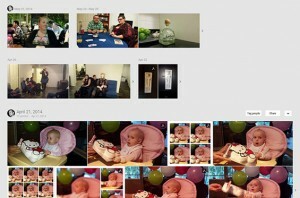 You can however share out individual pictures/videos with special links, or share entire folders with people. etc. 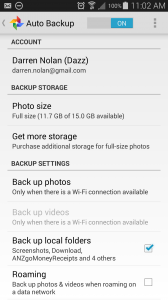 On your mobile, after installing, it’ll ask if you want to simply upload every picture/video you take or download. YOU SAY YES. This is great because after taking a picture, it’ll upload it to the same place your computer uses, and will download it on that as well. 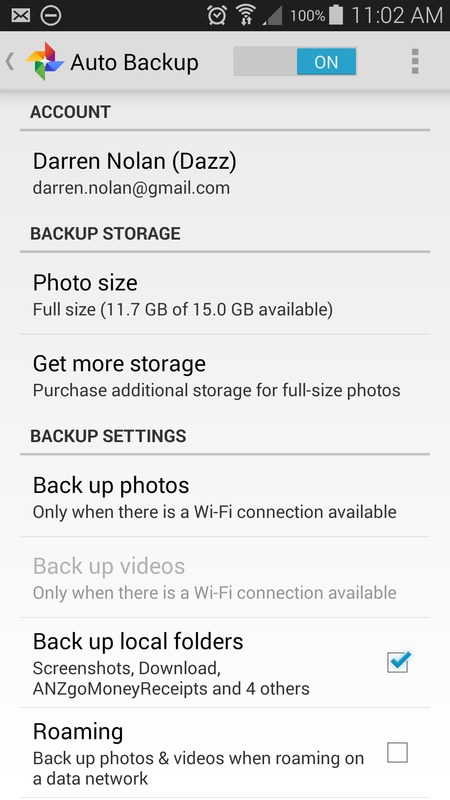 So you can (technically, if you did already) stop backing up your pictures/videos on your phone. Some nice alternatives for this fellow are Google Drive and OneDrive. Google drive being great if you already have a Google account, the same for OneDrive and Microsoft/Hotmail/MSN/Live/whatever account. Google + just started doing it for me one day, and I never let it stop. 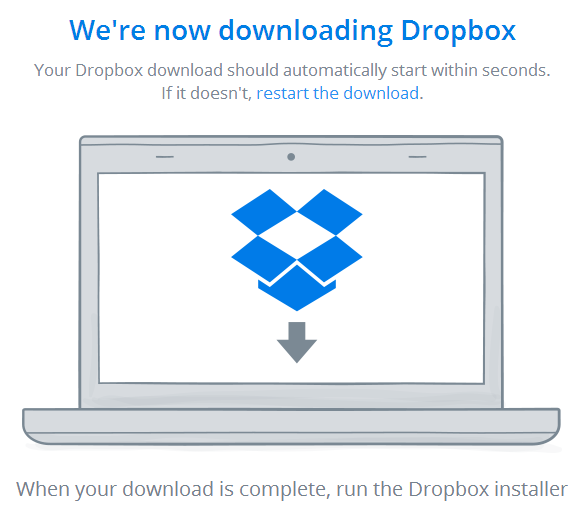 Once installed and you open it up, it’ll ask you the same as Dropbox, should I backup all your videos and pictures automatically? The answer here is yes. Google accounts give you something like 15GB of storage to use across all (most) your google services which is typically mail, and google drive. However, you can choose to not upload super-hi-resolution versions of your images and G+ will give you as many photos of these as you like. The alternative for you here would naturally be Facebook, because that’s what you use, offering to automatically upload all your pictures and videos you take on your phone. 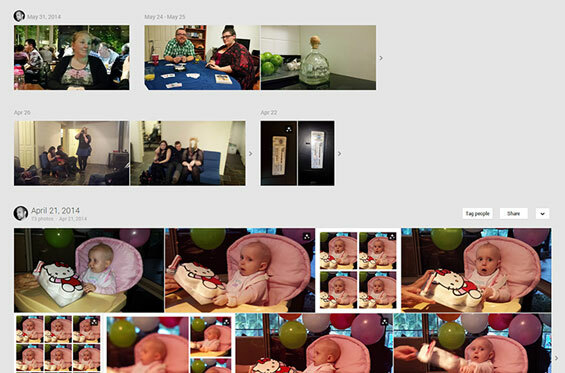 See how awesomely google + has a bunch of pictures, that haven’t been shared out (people might beat me up if I just showed everything I took a picture of….) just sitting there? The pictures of my niece I haven’t yet shared out (because I’m a slack uncle) – those were on my Samsung S4 before it decided turning on was too hard. I would have otherwise lost these pictures. But I always have them. I’ll never lose them now. YAY ME. Now with all these automatic backup solutions for your phone, I personally make sure it doesn’t happen automatically unless I’m connected to WiFi (at home, on my home internet connection) – because despite having 200gb on my computer, I only get 1gb on my phone. Which you can chew threw very quickly and get hit with expensive charges. SO. 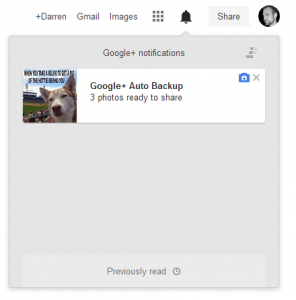 For all your pictures on your phone, I recommend letting google+/facebook upload them to private albums, and then you forget about it. Dropbox, use for all your documents and otherwise things that aren’t taken on your phone.